Personal spending and new home sales: restrain your enthusiasm! We got the last two significant data points of the year this morning: personal spending and new home sales. Both rose significantly. BUT there are big drawbacks to each. It just made a new low, at 2.9%, for this expansion. On the one hand, this is a concrete measure of consumer confidence, in that consumers are comfortable spending more of their income. But at the same time, a big decrease in the savings rate, such as we have had over the last 16 months, tends to happen later in expansions, and makes consumers more vulnerable to any inflationary shock. BUT... new home sales are one of the most drastically revised of all numbers. And the big jump to 685,000 in October was revised all the way down to 624,000! Meaning that October did not set a new expansion high after all. Look at the huge, ~50,000 jumps for the South and the West. The South might make sense if it is still a post-hurricanes rebound. But does anyone seriously think there was a 30% jump in a single month in the West?!? So I strongly suspect we're going to get another big downward revision next month. Next week I'll post a final update on my "Five graphs for 2017" along with a review of the 2017 forecast I made one year ago. After that, in the new year, I'll consider whether or not the US economy is actually entering a Boom. See you then! As I mentioned the other day, we have data going back nearly 100 years on the relationships between short and long rates, and between corporate bonds and treasuries. I'm looking at this because the yield curve never inverted between 1932 and 1954, during which time there were 5 recessions, one of which (1938) was severe. Last time I showed you the data since 1980 when the disinflationary trend started, so now let's look at the last deflationary period of the 1920s and 1930s, and the inflationary period from the end of World War 2 to 1980. The US Treasury bond trend looks very similar to the last decade. Over a 20 year period, yields fell gradually from 4% to 2%, with barely a blip during either of the two severe recessions during that period. Meanwhile BAA corporate yields were much more volatile, but gave little warning of the 1938 recession, and none at all in 1926. Discount rates were raised, ultimately sharply, in the late 1920s, but were completely flat prior to the deep 1938 recession. "Real" rates were positive only because the spread declined. Further, the spread between corporates and Treasuries gave only a few months' warning prior to both severe recessions. With the exception of the first half of the 1960s, there is a rising trend throughout this era, with sharper rises in the years just before recessions. This is the classic postwar Fed, raising rates significantly as the economy exhibits inflation, and lowering them as the recession takes hold. Meanwhile the spread between corporates and Treasuries gives us much more notice, making a bottom in roughly the mid-part of expansions or even earlier, with the sole exception of 1953. Further, during deflationary environments, waiting for an increase in spreads gives us much less notice of an oncoming recession, and even then the increase is well within the range of noise. Well, we certainly have the Fed raising rates now, and as a "percent of a percent" at the highest rates ever, but the spread is close to all time lows. What we still want to take a look at is real, inflation-adjusted rates. That's next. Yesterday's report on housing permits and starts confirms that the housing slowdown of 2017 is over. Based on the last five years, I can make a pretty decent estimate of the effects of the demographic tailwind of Millennials reaching house-buying age. It's bigger than I thought! This post is up at XE.com. The Baa-10-year treasury spread (top chart) is at a 10-year low. This is a leading indicator. The AAA-10-year spread (bottom chart) is also a 10-year low. This chart shows that the market is still searching for yield. After spiking earlier this year, CCC yields (top chart) have come in 45 basis points. This was a potential problem sign as this section of the bond market is the first to widen when trouble emerges. But the problem never cascaded out into the BBB market. The 30-day asset-backed commercial paper spread (top chart) that I wrote about on Friday has come back in. But it's still in the middle of a short-term uptrend as is the 90-day market (bottom chart). Why Did 30 and 90 Day Commercial Paper Spreads Recently Blow-Out? I watch a number of yields for signs of financial market stress. Above are the charts for the 30-day commercial paper/bill spread (top) and the 90-day commercial paper/treasury spread. Both recently blew out. 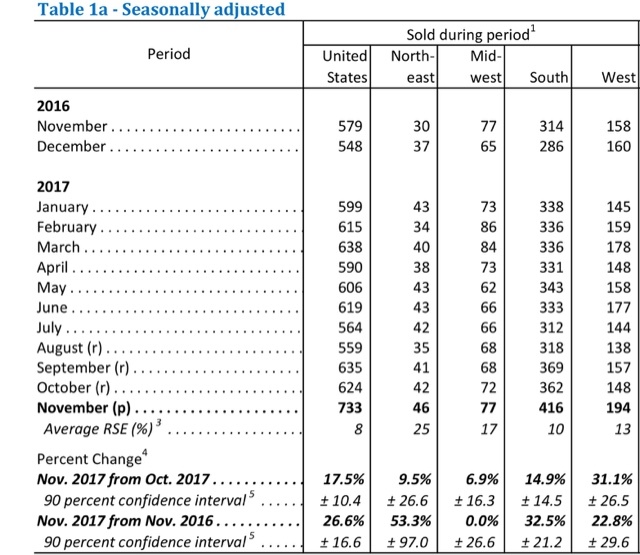 There have been any number of perfectly good and perfectly obvious write-ups of yesterday's retail sales report for November. I like to think much of my "value-added" is telling you not about what the data indicates about now, or about the recent past, but what it portends in the near and further-term future, and real retail sales is one of my favorite metrics for thet. 1. Real retail sales per capita adds to the evidence that, left to its own devices, the economy will not enter a recession in 2018. 2. The job market measured YoY should remain steady over the next 3 - 6 months. 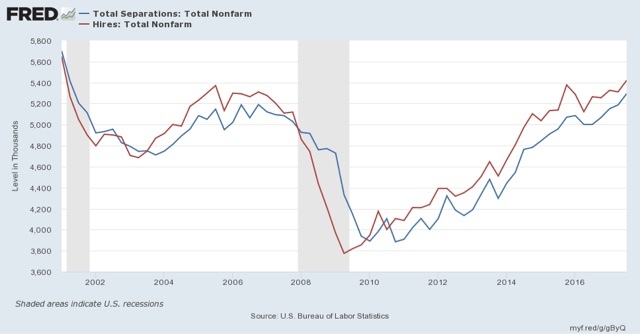 With the exception of the outsized moves in retail sales just after the recession, the correlation is pretty good, and the directional trend is a close match. 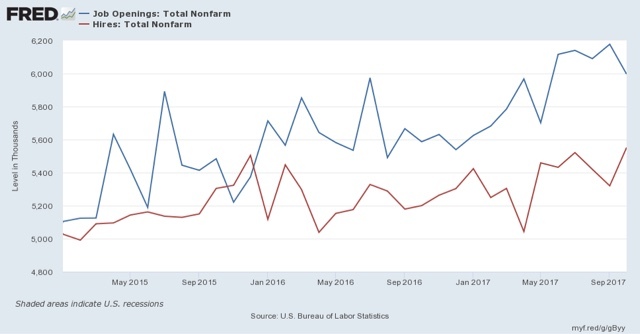 Bottom line: the recent improvement in retail sales, including the big numbers from October and November, at very least suggest that the employment situation will not soften significantly in the next few months. P.S. : I'd be inclined to treat the jump in the past several months as a hurricane-related rebound, but no such jump occurred after either Katrina in 2005 or Sandy in 2012. 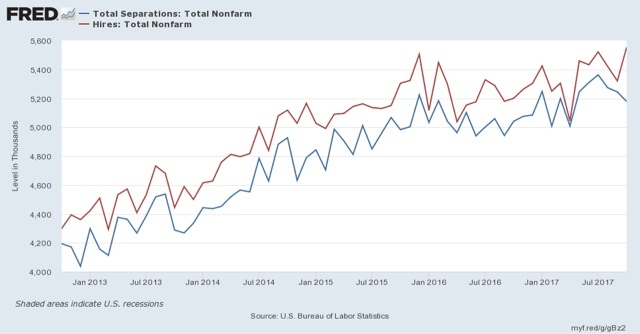 So lackluster has wage growth been that even the modest uptick in consumer inflation to 2.2% YoY in November means that non-managerial workers have seen virtually no real growth in their paychecks over the last 12 months. All wages are up +0.3% YoY, but nonsupervisory workers have seen only a +0.1% increase. Real wages rose by over 2% through July, but have actually declined since then, up to nearly -1% for all employees. Aggregate payrolls adjusted for inflation rose 2.3% this year through July, and have made zero progress since. This doesn't mean that we're DOOOMED, but on the other hand since workers have already dipped into their savings in the past year (the savings rate has declined by over 1%), consumers are ill prepared should anything like a spike in gas prices occur soon. 1.) The 10-year has moved lower since the recession. In the second quarter of 2009, the 10-year came close to 4%. It is currently in the 2.3-2.4 range. 2.) In absolute terms, the 10-year yield increased more than 100 basis points between the summer and fall of 2017, rising from 1.37% to 2.6%. Traders called this the "Trump trade." 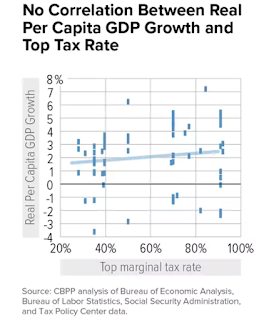 They believed that Trump would increase fiscal spending (largely on infrastructure) and lower taxes. The combination would increase growth and inflation, hence the sell-off in the long-end of the bond market. Since the election, yields have trended lower, incating the "Trump trade" is losing steam. 3.) The Y/Y percentage change in GDP has mostly printed between 2%-3% since 2010. 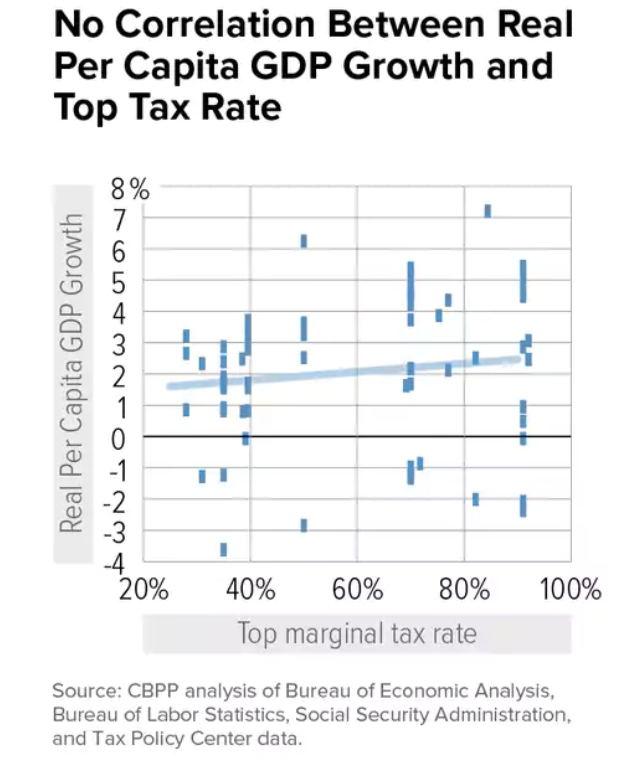 Weaker GDP growth is a function of slowing population growth, lower productivity, and the "debt-deflation" growth dynamic that characterized this expansion. 4.) Yields are fluctuating between ~2% and ~2.6% -- hardly a level indicating booming growth. This means bond traders are thinking, "more of the same is coming." This isn't the first time the Fed has engaged in a rate hiking campaign in the face of somnolent inflation. There were are least three prior episodes. I take a look at the reaction of the bond market and the economy over at XE.com. The chart above shows the Y/Y percentage change in the average hourly earnings of nonsupervisory employees. We can break this data down into two sections. Due to higher inflation and stronger unions, the pace of growth was far stronger before the 1980s. We see a different dynamic at work during the first three post-1982 expansions. 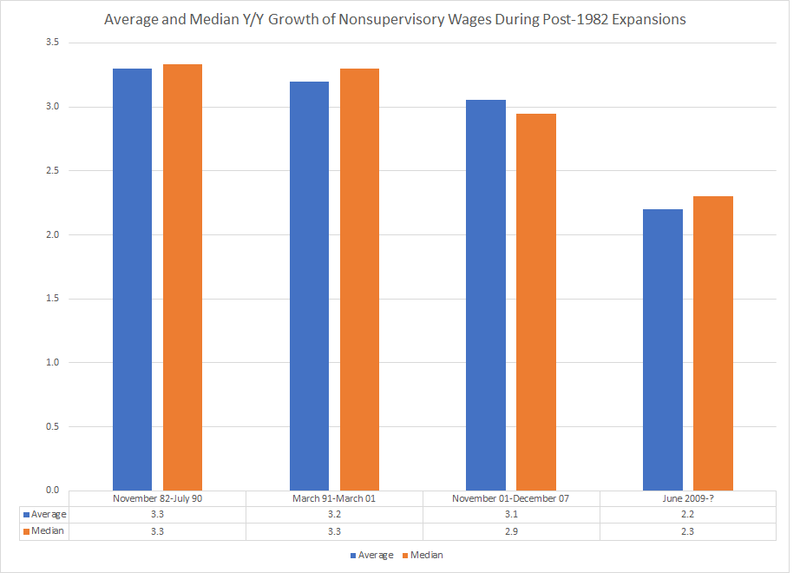 Wages decline coming out of the recesssion, falling to ~2% Y/Y percentage growth rate. They then climb during the second half of the expansion, peaking ~4% Y/Y percentage growth rate. This probably explains why the Fed remains thoroughly convinced that the Phillip's Curve is still in play: they're assuing the past is prologue, and with good reason. However, this expansion we see a different growth dynamic at work. As before, the Y/Y percentage change dropped to 2% a little before the expansion was halfway over. But the pace of growth in the second half of the recovery is far weaker. Hence, we have weaker wage growth. The pace is clearly declining. The August and September hurricanes continue to make their impacts felt in the economic data. 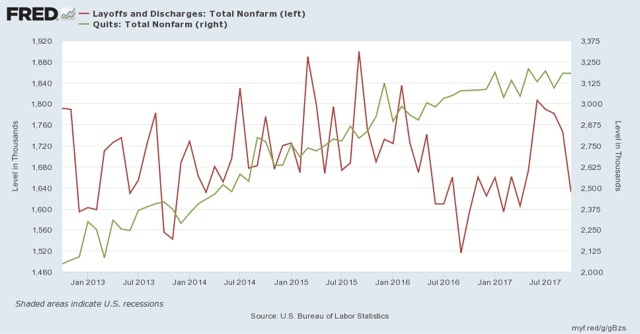 Yesterday's JOLTS report for October, like the October and November jobs reports, shows a rebound from those impacts. The best way to look at the data is to average the last two months (and this will be true for the next JOLTS report as well, which will be best viewed by averaging all three months). Let's start as usual by updating the disconnect between the "soft data" of openings in this survey and the "hard data" of actual hires and discharges. As I have pointed out many times, openings can be just chumming the water for resumes, or even laying the groundwork to hire foreign workers. The disconnect betrays an unwillingness to pay new hires more, or to engage in on the job training. This is pretty impressive. 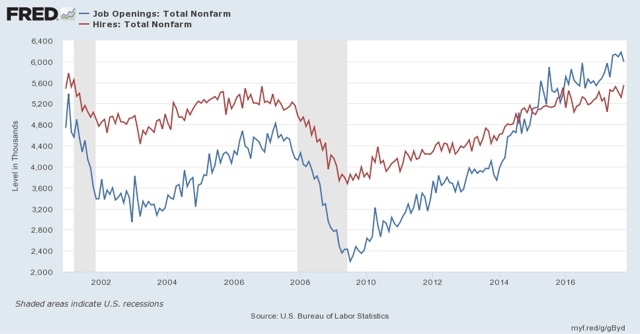 It shows that outside of the South, both openings and hires are at new highs, and involuntary separations have receded. The only sore spot is quits, which peaked over a year ago, although they have improved compared with earlier this year. The report yesterday was a good one, but on the other hand, it is very consistent with being late in the cycle.